The Bird's eye chilli is a small chilli, and is one of the spiciest. It's used extensively in Thai cooking. It is often referred to as simply, "The Thai Chili" The Thai name (Prik khi nu) literally translates to "mouse-dropping chilli". 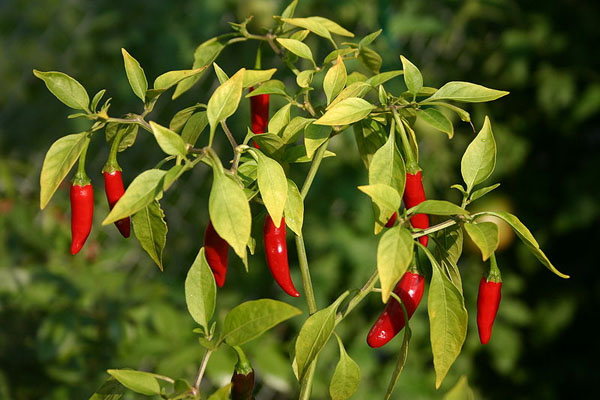 The bird's eye chili plant is a perennial with small, tapering fruits, often 2-3, at a node. The fruits are very pungent. The flowers are greenish white or yellowish white. The bird's eye chili is small but is quite hot. It measures around 50,000-100,000 Scoville units which is at the lower end of the range for the hotter Habanero chili.